WATERLOO, Neb. 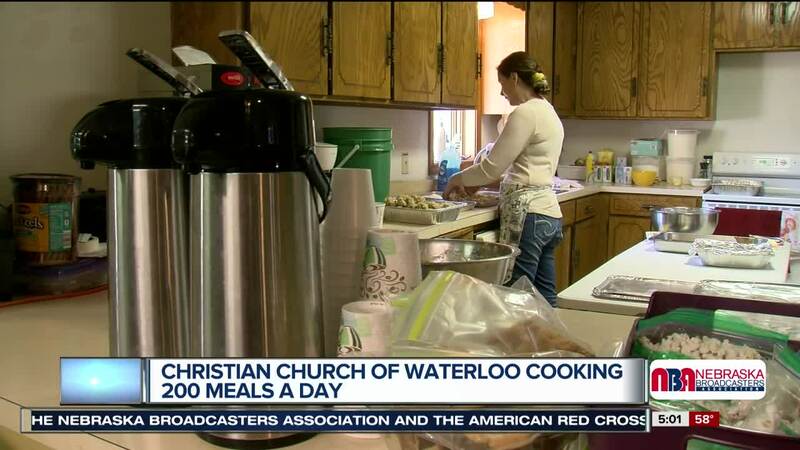 (KMTV) — A woman is helping cook meals for flood victims at a church in Waterloo. The catch, she's not from Waterloo and had never been to the church until Tuesday. Carrie Messinger and her friends offered to help in the kitchen at Christian Church of Waterloo. Since Tuesday the Millard woman has cooked more than 650 meals, providing three hot meals a day to the flood victims in the area. "We have people who at the end where the road stops they are in kayaks to get to their homes and they're bringing me farm fresh eggs every day to cook in this kitchen," Messinger said. "These people who have so little are still stepping up to share the little that they have and that is so overwhelming." if you want to donate food or supplies to the church, there's a list of needed items on their Facebook page .